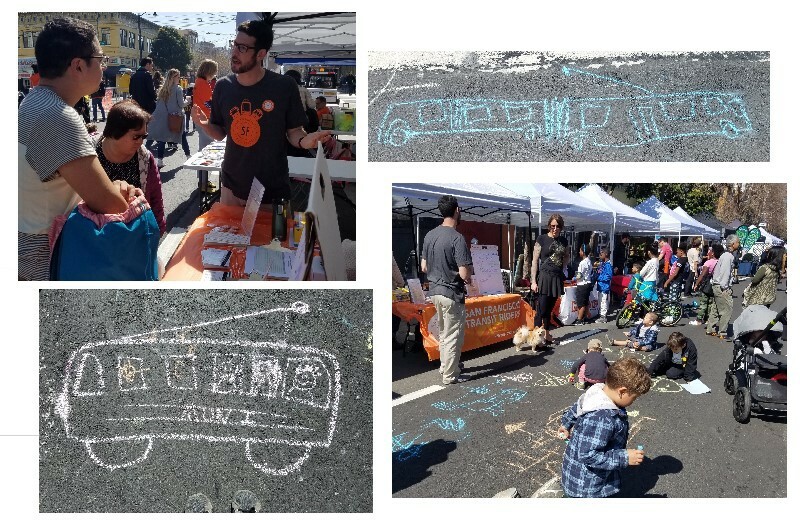 We had so much fun at Sunday Streets yesterday. It’s amazing what magic can happen when you put together some kids, some sidewalk chalk, and a car-free space. When people see what we’re about, they want to talk! There were lots of riders, both frequent and infrequent, young and old, excited that we’re out here working for them and their ride. Lots of kids are learning to ride the bus at a young age, and enjoy it— hooray! Reliability and frequency are big problems on a lot of lines (but no longer along Mission Street — a win). Accessibility is an issue — women getting strollers on the bus don’t always get the lift they need, or the platform stop they request. It’s hard enough to raise a kid, never mind in San Francisco, never mind on transit. We need to do better for them. Accessibility is an issue — those “community connectors” that never come; the hours added to your commute when the 23, 67, 27 lose a bus, or a driver, or just decide that 53 minutes is a fine amount of time to wait. People love us! Folks who never heard of us, or never thought of themselves as transit riders, understood our purpose immediately and were excited to talk transit. They signed up and wore our buttons and stickers with pride. We’ll be at Sunday Streets all year! Please sign up if you’re available to come greet your newest fans.